This rug is even more beautiful in person! The contrast of blue on cream really makes the color pop and fits perfectly in my coastal living room. The braided fringe is a nice added detail. Rug shipped very fast too. Would definitely recommend. It showed up so fast too! Ordered Tuesday & delivered Wednesday morning! Create a vibrant setting in your living room or bedroom with this striking area rug from Nourison. 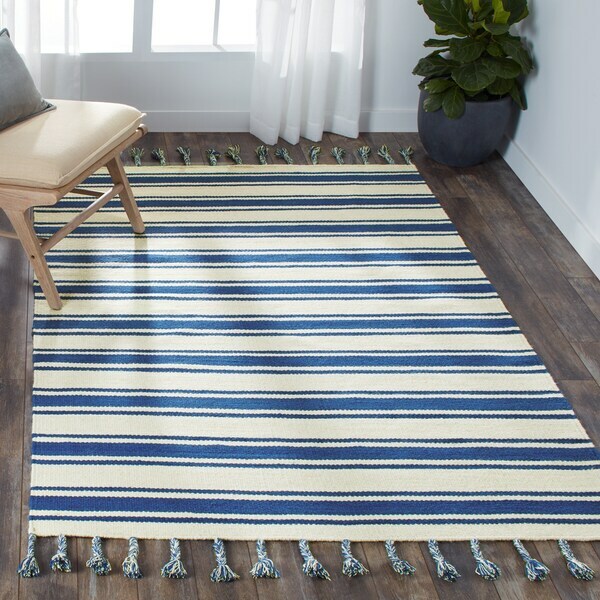 With a remarkable texture made from a combination of cotton, wool, and polyester, this hand-woven reversible rug features a colorful stripe pattern in ivory and navy that cheerfully enhances your decor. Dimensions 60in. x 90in. x .25in.